The Companions are a legendary group of Nord heroes, and have been part of Nord culture since Ysgramor's arrival on the shores of Skyrim before the First Era. 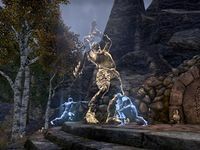 They are encountered in the Rift, where they will aid the Ebonheart Pact in fighting back against the Reachmen and Worm Cult invaders. They're based at Fallowstone Hall. This page was last modified on 9 February 2019, at 18:26.